Turns out we are definitely Irish, we are definitely German, and I’m pretty sure we are French Canadian too. The Native American part I think was just thrown in for fun. Nevertheless, it was a start. 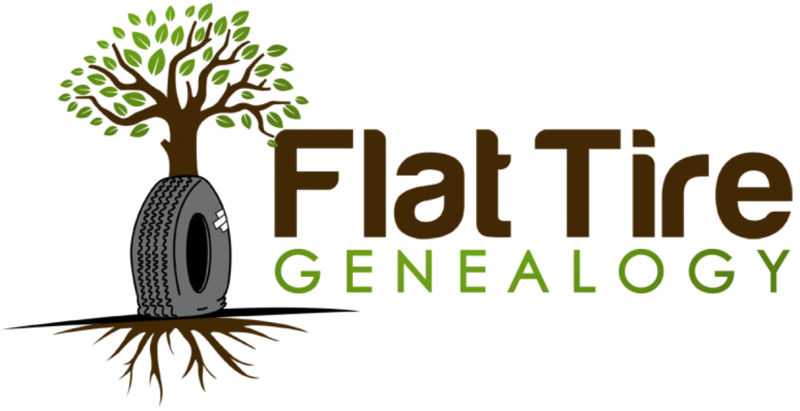 After unearthing the birth certificate of my great-great grandfather last year, I was finally able to move back another generation and either prove or disprove the stories that Henry Burns had told my grandmother when she was a child. What my grandmother could recall is that Henry Burns went by the nickname Harry and his father had immigrated from Ireland to Canada and finally to New York. She also recalled that he had a sister named Teresa. Below is a 1900 census record from Brooklyn that I found that HAD to be my ancestors. There was a Harry, there was a Teresa, and there was a Charles and a George (which were names that were constantly circulated in the Burns family over the generations). Not to mention, Harry and George were both listed as Cabinet Makers. Not only was my great-grandfather a carpenter, but Henry Burns was also a carpenter. This was definitely my family. As you can see, there was also “a little bit of Irish, and even a little bit of French Canadian” shown in this census record as well. Charles Burns (my 3x great grandfather) was listed as widowed though in 1900. At the time, I wondered what had happened to his wife. When exactly did she pass away? Where was Mary MacCadden Burns buried? The next couple of records that I found had shed some light on these questions and gave me a better look at the makeup of the family of Charles and Mary Burns. This New York State census record from 1892 shows the entire family in Brooklyn again (this time with a few more children). You can see Charles and Mary Burns with their 6 children (Mary, Sophie, Charles Jr, Harry, George, and Teresa). The next record I found though gave an even more clear picture of the family. 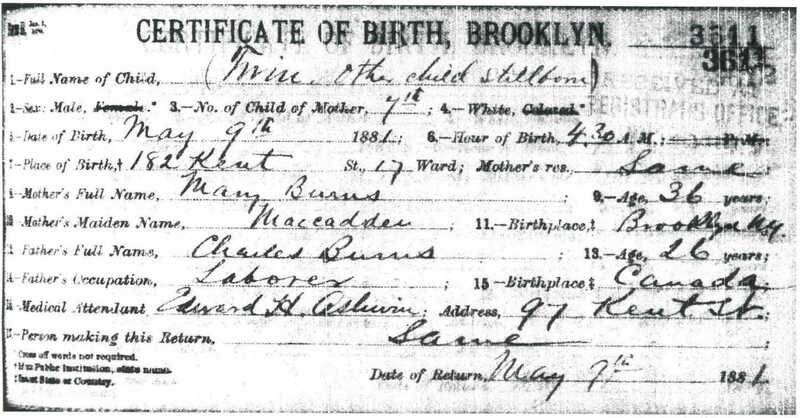 This 1880 census record from Brooklyn shows Charles Burns (at age 24) with his wife Mary (at age 34) and their two children Sophie (age 3) and Charles Jr (10 months). 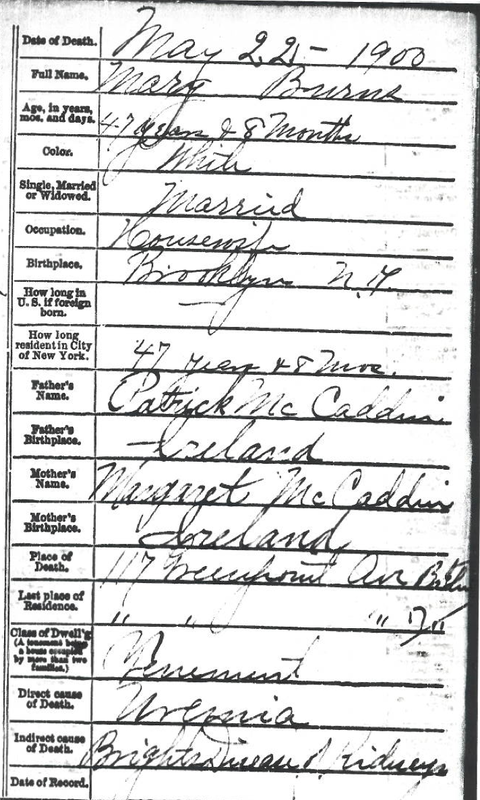 Mary’s mother Margaret McCadden (my 4x great grandmother) is also listed as living with them in addition to Maggie and Mary Sweeney (Charles’ stepdaughters). So, going from 1880 to 1892, you see a bit of discrepancies. First off, you discover that Mary Burns had at least two daughters from a previous marriage. And secondly, you see a rather large difference in age – Mary is 10 years older than Charles in 1880 whereas she is listed as only being 3 years older than Charles in 1892. We get a better sense of her true age later, but still Mary had an entire life before Charles came into it. I’d be interested to learn the circumstances of their meeting and hope to one day uncover a marriage certificate. 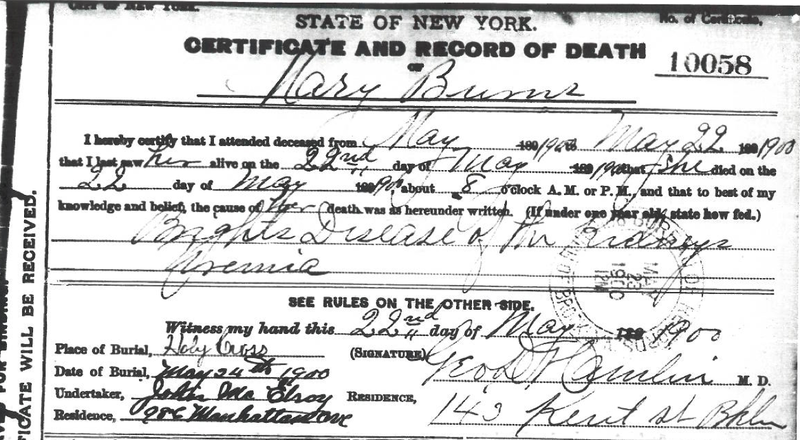 After completing a little bit more digging though, I was able to obtain the death certificate of Mary Burns. 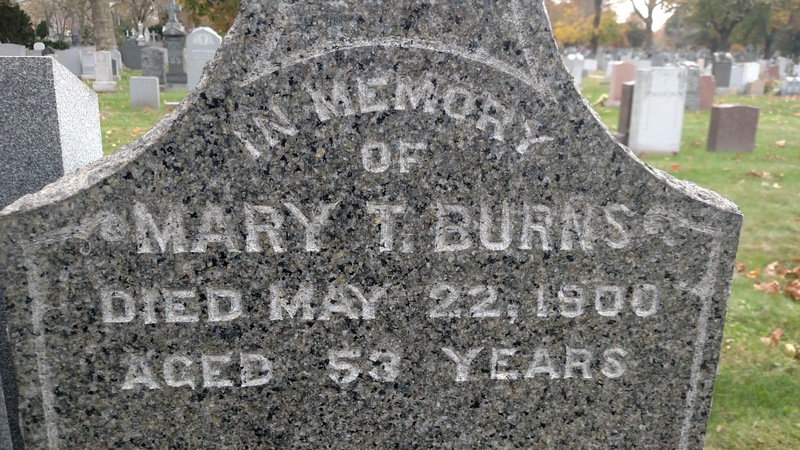 Mary Burns passed away on May 22, 1900 from Bright’s disease and was buried at Holy Cross Cemetery in Brooklyn, New York. Her father is listed as Patrick McCadden and her mother as Margaret McCadden, both of whom were born in Ireland. As you will see, her true age will remain a mystery. However, I think it is more than safe to say that she left her family still too young. On a nice overcast day in November of last year, I decided to make the journey into Brooklyn to Holy Cross Cemetery. In fact, Mary Burns was the last of my ancestors (out of the ones where I knew where they were buried) that I had yet to visit. Unlike my experience at Calvary Cemetery, the employees at Holy Cross were incredibly generous in providing information about where she was buried. For sure, I thought that she would be buried with my great-great grandfather’s twin (the one that he “kicked to death”). However, it turned out that she was by herself. The employee confirmed that and had no record of another infant that died in the year 1881 by the last name Burns. Ironically though, a headstone opposite the headstone of Mary Burns caught my eye. Coincidence? Maybe. Maybe not. 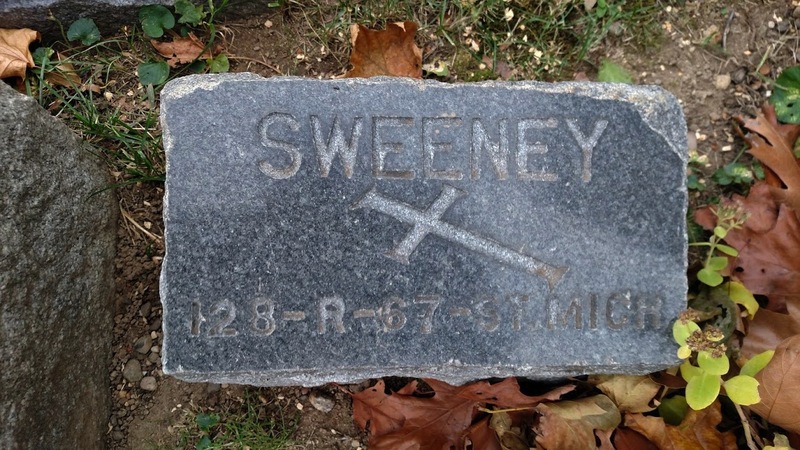 I have to do more research into this, but I find the fact that there are Sweeneys buried so closely to be a sign that perhaps Charles Burns wanted her to be as close as possible to her first husband and any children that she may have had with him. Or maybe that was her request? Who knows? Hopefully, one day I am able to shed some more light on that. Finding a birth record for Mary MacCadden would be nice too. That way we can actually figure out if she was 47 or 53 (as indicated on her headstone). Either way it was awesome to find my 3x great grandmother, Mary T. Burns. If you know anything about the MacCadden family or the Burns, please leave me a comment. Until next time, keep digging!